Delhi CM Arvind Kejriwal and Union Housing Affair Minister Hardeep Singh Puri inaugurated Delhi Metro’s Pink Line today. The 8-km stretch line connecting South Campus to Lajpat Nagar will support new stations – Sir Vishveshariah Moti Bagh, Bhikhaji Cama Place, Sarojini Nagar, INA, South Extension and Lajpat Nagar. The section is designed to connect major South Delhi markets will have an important part in reducing the travel time for commuters by up to 20 minutes. The line will connect four major markets of the city on one stretch. The line currently operates six stations, which also includes interchange facilities at INA (with Yellow Line) and Lajpat Nagar (Violet Line). The stretch is part of 59 km-long Majlis Park-Shiv Vihar corridor (Pink Line) resting under the Phase-III of the Delhi Metro. 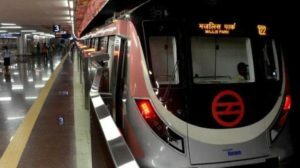 The stretch is also expected to reduce the travel time between INA and Rajouri Garden from 40 minutes to 23 minutes, Lajpat Nagar-Rajouri Garden stations from 45 to 28 minutes and Lajpat Nagar and Netaji Subash Place (Red Line) from 47 minutes to 39 minutes. “After the inauguration of this line, the total operational network of Phase III will increase to 106 km,” said DMRC.